Dare to be ourselves, says May Sarton. Well who else can you be? There are those who, watching TV or surfing the web, try on a lifestyle they find appealing only later to discard it as a poor fit. To see a movie example, consider this: Berry Gordy’s Last Dragon. It’s a funny movie from the mid-80s— a sendup of martial arts movies and Blaxploitation flicks. Coincidentally, it also features an early version of music videos. Among the funny characters are the self-proclaimed toughest kung fu master in town, who calls himself Sho-Nuff, the Shogun of Harlem. Dressed a bit like a member of P-Funk, you get the gist right there. There is a group of Korean youths who run a fortune cookie plant and aspire to be soul brothers—complete with boombox, hand gestures, clothes they expect to match the lifestyle and lingo to complete the package. The protagonist is African-American but is into martial arts; he wears black pajama-styled clothes and a coolie hat. As it turns out, he is in fact the true kung fu master. While it’s OK to become skilled at a discipline like martial arts, my opinion is that maintaining an authentic sense of self as you are is more sensible than trying to live the life of someone you are not. I am at the Book Fair today in Charlottesville, Virginia peddling my wares. 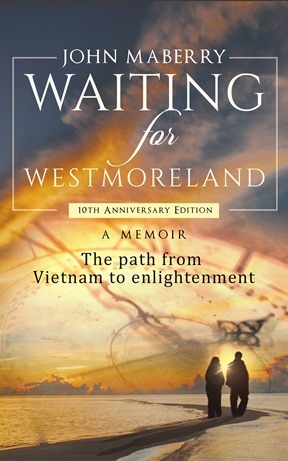 Offering signed copies of Waiting for Westmoreland that is. See details in Booktour.com, link to the right. With the advent of Eckhardt Tolle and other spirtual writers, I hope you will consider reading my real life version of finding your inner purpose along with a clearly articulated methodology and vision to get you there. Oprah comes later for me.